The movie opens on a splendidly weird battle between the Guardians and a slimy space monster. Their job: protect the super-batteries that power the world of the Soverign, a golden-skinned race who believe themselves superior to all others. Which is probably why, after the heroes defeat the slimy space monster, Rocket decides to steal some of the batteries. He’s like that. Though the action – chases through space, crash landings, a battle with a near-omnipotent being – is breathtaking, what takes this sequel to its greater heights are the human stories. Quill’s desire to find his father. Gamora’s troubled relationship with her sister Nebula. Yondu and his Ravagers’ exile from the larger community of Ravagers, the reason for their breach of the space pirates code and their misery at being outcasts among outlaws. Characters finding unexpected common ground with others. Even more than in the first movie, the characters come to life in ways that make them very real to the audience. The acting is as good or better than in any of the Marvel movies. For that matter, it’s as good or better than in most other movies released in 2017. 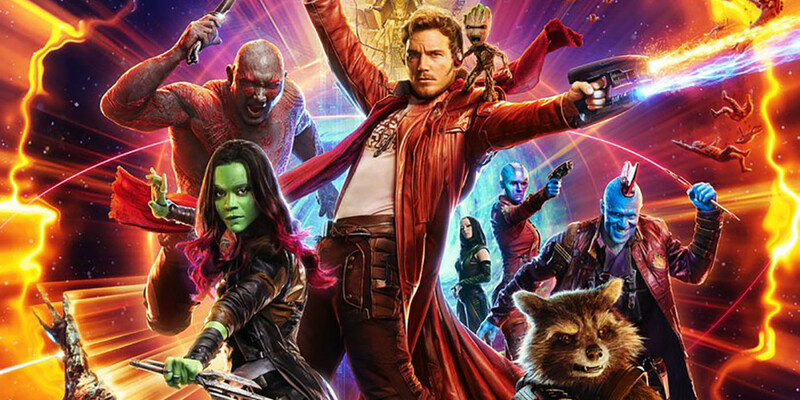 Chris Pratt (Star-Lord), Zoe Saldana (Gamora), Dave Bautista (Drax), Karen Gillan (Nebula), Pom Klementieff (Mantis), Kurt Russell (Ego) and Vin Diesel and Bradley Cooper as, respectively, the voices of Baby Groot and Rocket are all amazing. But, the star of the film is Michael Rooker, who deserves an Oscar nomination for his layered portrayal of Yondu. It’s the performance of a lifetime and left me eager to see what he does next. Marvel Comics readers will squeal with sheer delight at all the new characters the movie introduces into the Marvel Cinematic Universe. The vastness of that universe is used to great effect and, even if a viewer doesn’t share the “oh, wow” recognition factor of devoted Marvelites like me, the writing never leaves said viewer out of the loop. What a ride! Director and writer James Gunn probably won’t get any nominations for either of his roles on this movie, but he deserves them. I am already looking forward to Guardians of the Galaxy Vol. 3. Guardians of the Galaxy Vol. 2 will be in the theaters for several weeks to come, but, if you haven’t seen it yet, don’t put it off. You’ll want to see it more than once and you’ll want to tell your friends and loved ones about it. If the fates are kind, the movie will be available for purchase on Blu-ray and DVD before the winter holidays. It would sure make my gift shopping easier. 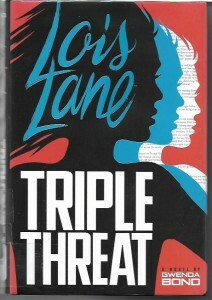 Lois Lane: Triple Threat by Gwenda Bond [Switch Press; $16.95] is the third hardcover novel in the reimagining of the classic comics character by the noted young adult and children’s author. In these books, teenage Lois and her family have settled in Metropolis after bouncing around from army base to base depending on where her dad, General Sam Lane, was stationed. She’s made friends at her school and works part time for the Scoop, a teen department of The Daily Planet. And she has an online boyfriend she’s never met in person. He goes by the screen name SmallvilleGuy. SmallvilleGuy is coming to Metropolis with his parents so he and Lois can finally meet. Pressure, much? Bond’s Lois Lane is one of the best versions of the character. She is a dedicated journalist, but she also has the empathy to consider the people behind the stories. She has a suspicious mind, but she is also learning to trust people. Like SmallvilleGuy, she wants to do good in the world, which sometimes means making touch decisions, not all of which this reader would agree with. I’ve enjoyed all three of these Lois Lane novels. I recommend them to you and hope we’ve not seen the last of them. My weekend light reading was Disney Frozen #1-6 [$2.99 each], which were published by Joe Books, a Canadian comic book company with the rights to publish comics based on Disney’s animated feature films and TV shows. I’ve been aware of the company’s existence, but this is the first time I’ve read any of their offerings. 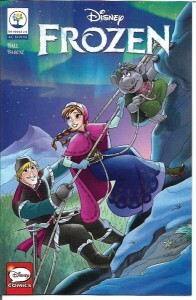 Written by Georgia Ball and drawn by Benedetta Barone – with some other hands on deck from time to time – the Frozen comic books are aimed at young readers, but not so young that it prevents an older reader from enjoying them. The longer stories are good and usually have morals about family, friendship and goodness to share. Their drawback is that Ball seems to shy away from any real suspense of sense of jeopardy. Even as a kid, I wanted stories to have a little edge to them. A couple issues of Frozen are filled with short gag stories of one or more pages. These fall so flat that I wonder if they come from U.K. comic books. While there are amazing Disney comics coming out of Italy and other European countries, the Disney U.K. product has been almost unfailingly tepid…and that’s coming from a writer who once had the job of making them somehow less tepid for the American audience. I liked Frozen – the movie – a lot. Kids love Frozen a lot. Those kids would certainly be thrilled to have Frozen comic books, which make great little gifts and rewards for the youngsters. However, if you’re an older reader, you’ll want to pass on these comics.